Home > Mobile Advertising > Why Monetization Solutions Needed a Game-Changer? And How Kazoolink Made it Possible! Well, Kazoolink has finally emerged and stands out from everyone else in the shoal of fish. It’s a whole new direction and approach to mobile app monetization. Unlike other networks with an offer wall, Kazoolink gives you a secure and profitable way to ensure success for the future of your application and company. The campaigns have a lot higher payouts and you’re not limited to the users of your app, but you can now capitalize on users you don’t even have. Also, you can easily multiply the earnings from each offer in the wall. 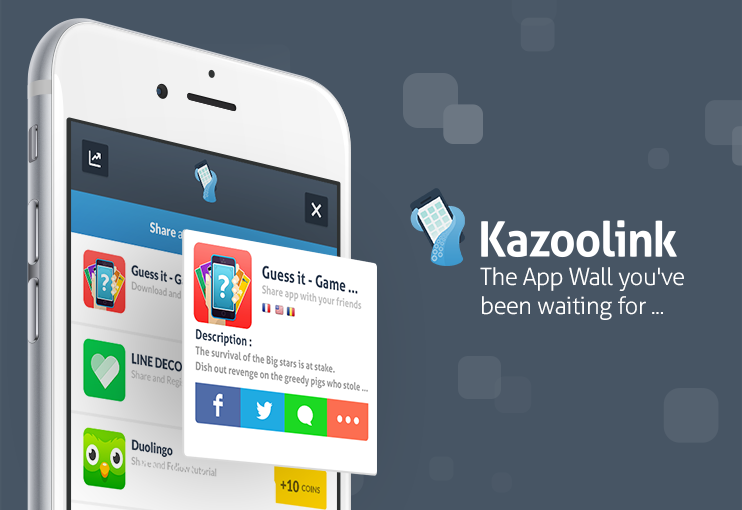 Kazoolink brings the virality of social networks and app recommendations to the mobile advertising world. By creating a wall with a sharing option, app developers can now see eCPM and LTV of their users that they’ve never seen before, or even dared to dream of. Their solution also gives advertisers a stream of high-quality users that are not rewarded for downloading their app, which supports the amounts paid to publishers who choose to monetize with Kazoolink. Stop letting users leave your app for $0.20 and hope that they’ll come right back. The incentivized offer wall alternatives haven’t renewed themselves in a long time and app developers are struggling with the low revenue and interruptions in the UX which are the two most common side-effects from this. Let the user quickly recommend a few apps to his/her friends and then check back inside your app later to find statistics on how many downloads and in-app currency they’ve generated. Also, multiply that payout by 10 and let’s say the user brings in 5 downloads. You’ve just increased your revenue on 1 offer performed by 1 user from $0.20 to $10. And the user doesn’t even have to download anything or spend much time. To start increasing your revenue is easy. Setting up an account is done in only 5 simple steps and the integration is a secure and simple HTML5, which is generated by the smart and user-friendly platform. From your dashboard, you can also find all the relevant data you need, in real-time. Making money on your app has never been this easy! By giving users the ability to recommend apps to friends, you’re keeping them inside your own app while multiplying the large payouts for each download they’re bringing in. This leads to an opportunity to get big in-app rewards for the users and app developers can finally add another zero or two behind their income. Isn’t it time you start thinking bigger about your app and really go after the big money? If you want to increase your revenue significantly and capitalize on the rapid changes in the mobile market, Kazoolink will help you be successful. To find out more, check out Kazoolink.com! Kazoolink is the new monster ad unit emerging from the sea to serve advertisers, publishers and mobile users in one easy, strong and beautiful way, simply by taking advantage of our awesome new platform. Headquartered in Paris and with a global presence, Kazoolink offers the best solutions for app developers and advertisers to generate incredible results. This entry was posted in Mobile Advertising and tagged advertisers, app advertising, in-app advertising, mobile advertising, mobile affiliate networks, monetization, publishers. Bookmark the permalink.